Sam Bahour has been working overtime getting this type of information out to his friends, despite his own personal problems with the system. I felt the least I could do is publish what he sent me so the audience is that much wider… hopefully. The text under the photos is Sam’s… not mine. The related article was updated on HaAretz this evening. 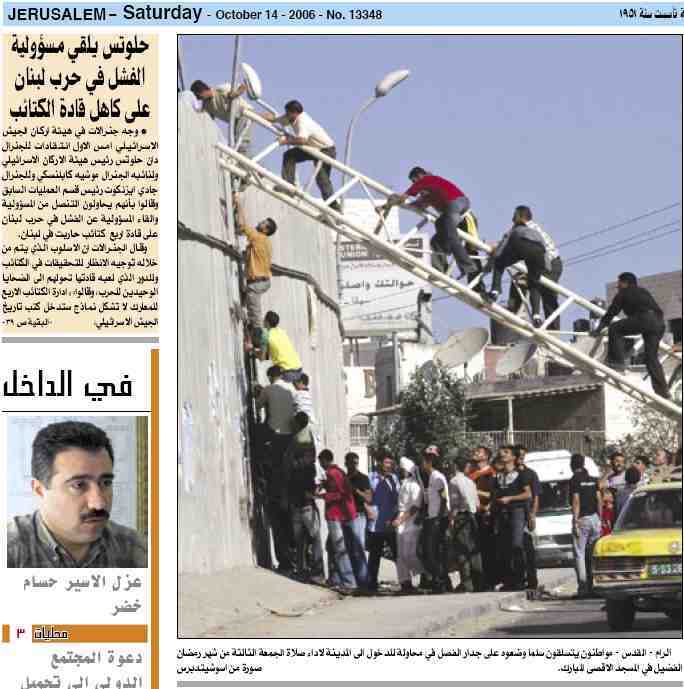 The one from page 1 is how Palestinians entered Jerusalem yesterday for Friday prayers this Ramadan month. 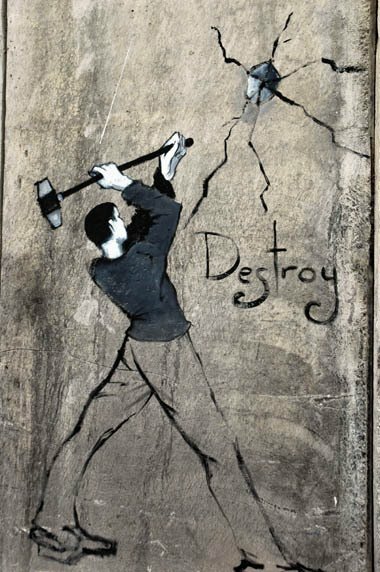 So much for the separation wall. What is it called…Freedom of Religion? The man pictures to the left in the page one pic is Husam Khader. An elected Palestinian lawmakers imprisoned in Israeli jails for several years now…so much for political immunity. Then they have the gall to ask where our leaders are! 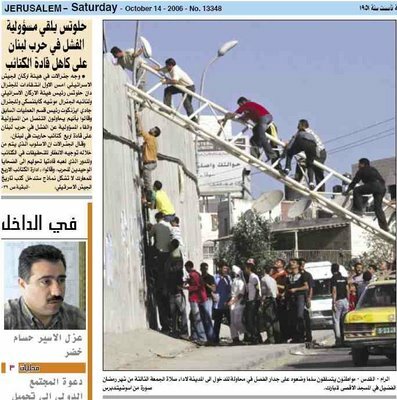 The one from page 2 is the main checkpoint for those wanting to cross from Ramallah to Al- Ram, two Palestinian cities. It is the infamous Kalandia Checkpoint. Al-Ram is on the way south from Ramallah, towards Jerusalem. The caption explains the picture: masses waiting for Israeli soldiers to approve them to pass, one by one. 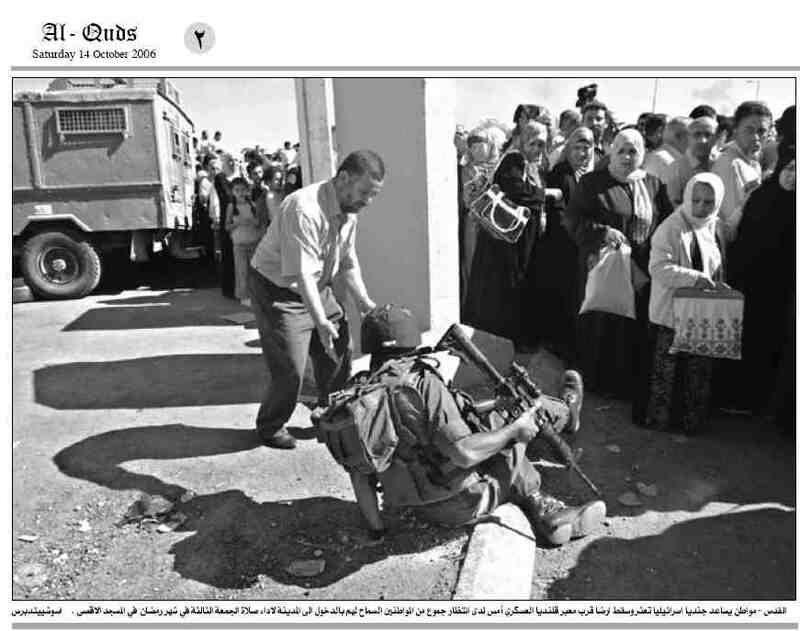 A Palestinian helping an Israeli soldier, the occupier, who fell on the curb while walking backwards. So much for no one to talk to. What is it called…Humanity? The presidents of Palestinian universities published an open letter Saturday calling for the international academic community to work against the Israeli policy of restricting movement within the Palestinian territories and entry into them. The letter stated that since the beginning of the year, and even more so since the Hamas victory in January parliamentary elections, thousands of foreign passport holders of Palestinian or other origin were denied residency or permission to work in the West Bank and Gaza Strip. “Israel has illegally taken hold for itself the right to authorize or reject work permits for foreigners to territories of the Palestinian Authority,” the letter said. “Many of them are of Palestinian origin, and currently hold foreign passports because their identity cards were canceled while they worked or studied abroad, or because their requests for family reunification were rejected by Israeli occupation authorities,” it added. Fourteen presidents of universities and other institutions of higher education signed the letter, including the presidents of Al-Quds and Bir Zeit universities and the Islamic University of Gaza. That is an ongoing nightmare!! I just checked and found, Sam had sent that to me as well … I will post the report of Professor Dugard! The picture speak for themselves … they speak VOLUMES!! BTW .. Sari Nusseibeh is a GREAT guy – I know him briefly from a lecture/discussion he gave together with Amira Hass. Thanks Karin… good to see that we have such wonderful mutual friends. Yes, Sari Nussebeh is a GREAT guy as you say… I have only heard good things about him. Jazak alla khair, brother desertpeace. The article was touching, as was the picture. ZEES JUST EEN: The Jerijihad post sez that Muslim leaders fail to articulate anything of diplomatic importance and simply categorically “forgive” Christiano-fascist Il Pape for his trash-talking trespasses! Good to see you behemoth… I just looked at your post… I hope others will do s well… it was good!